Rainy days - thank goodness! We've had a half and half day today - warm sun in the morning and warm rain in the afternoon! I planted out the sweetcorn this morning, so I'm grateful for the rain. It's been very dry for about six weeks, but we had rain earlier in the week and today, so everything is growing great - including the weeds!! The worst thing about having to net everything is that weeding is a bit of a chore. I find the job quite satisfying but I hate taking off the net and even worse, trying to put it back on. It's much easier with two. Read more on Rainy days - thank goodness! Since we got the sheep in September, I've been waiting for something to go wrong. And this week it did. I had been meaning to get some "Crovect" to treat ectoparasite - flies, ticks, lice etc. but just hadn't got round to it. On Wednesday, Jura was fine - in Thursday, she was obviously distressed, wet backend, not eating, kicking at herself. Even without examining her, I was pretty sure that it would be fly strike so Dan went off to get "Crovect" and four 6 foot sheep hurdles. After work, we caught the three sheep. Jura's the least tame but they all get anxious if Dan and I go into the field - they're fine if we go alone! We trimmed Jinx and Juno's feet (Jinx's grow much faster than the other two) and sprayed them with "Crovect". Then it was Jura's turn. Actually, it wasn't as bad as I expected - the maggots were numerous but small (I had endured some remarks about "bush tucker" from my boss earlier in the day), so I cut away as much fleece as I could and sprayed the area with "Crovect". Fortunately, her skin seemed to be undamaged. When we let them out, she immediately started grazing and looked much easier. A check today showed that all the maggots were dead - so we applied "Maggot Oil" to sooth the skin and prevent further problems. She now looks fine and is eating and cudding normally. It's been very warm and sunny here, with short spells of rain - ideal growing conditions, yes. But weeds like it too! 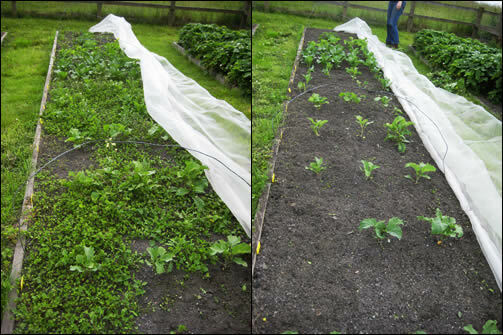 Today, we peeled back the net from the brassica bed and spent a merry half hour weeding. Actually, it was quite satisfying, so we did the carrots and the parsnips as well. Then we sowed some runner beans, since the first lot seem to have failed, then some dwarf French Beans as well, since there was a space and we don't have many beans in this year. In the five years or so that we've kept pigs, it has been pretty trouble free. Today, I thought we might be in for a downturn. One of our three boars didn't eat this morning. He was slavering a bit, but his breathing was normal, his "digestive transit" seemed to be in order, but you don't like to see pig off its grub. I have to confess, I did check his feet for blisters or lesions, and inside his mouth but there were none. I sat with him for a bit - he'd gone back to bed - and offered scratches and sympathy. We decided to wait and see. We've got a broody hen. We've never had one before and it's one of the older Black Rocks. I've ordered some eggs off eBay and will try to get her to sit - if she doesn't I'll stick them in the incubator, but she might as well do something constructive. Hopefully, the eggs will come tomorrow and I'll get her settled tomorrow night. Highland Show tomorrow, so I hope the weather's good. Well, dry will do! Yesterday evening, I glanced through our (as always) open back door to see big brown wooly thing. Juno, accompanied by Jinx, had escaped from the top of the orchard! In true Ryeland form, they had stopped at the back door to check for any grub and were spotted. Jura, meantime, was going nuts in the orchard. Encouraged by a small bowl of sheep mix, the two escapees were tempted back to the orchard and reunited with Jura. I think a certain collie called Tess may have had a paw in "encouraging" the escape - she does tend to herd the hens into the kitchen, so maybe she thought we needed different company. Fortunately, there's no harm done, but all the intermadiate gates are now closed. Read more on The big breakout! Since we got the sheep, it has been our intention to use as few chemicals as possible. They were wormed immediately before we got them and were turned on to clean land that hadn't had sheep on it since about 2003, when we fenced our land. We started using Verm-X, a herbal wormer - we also use this for the hens. However, I decided to get a worm test done by Westgate Laboratories. Essentially, it is an equine service but they are happy to do other species, too. Our sample came back as <50 eggs per gram and no eggs were seen. On that basis, I have decided to worm on a "need to" basis, based on worm egg counts. I'll have another test done before tupping, so that I can worm if required. The above show will take place on Saturday 13th September 2008 in Devonvale Hall, Tillicoultry. It is open to the public from 1pm until 4.30pm. The hall is opposite Sterling Mills and next to Sterling Furniture Warehouse - so if you fancy some retail therapy, you can combine it with a visit to the show. There are classes for vegetables, flowers and plants, craft, baking and preserves, floral art and photography. There are special classes for children and teenagers and I'm hoping that some of our schools might take part, since some now have vegetable gardens. Our three sheep were sheared for the first time today. I was a bit anxious - not by the shearing itaself, but in getting someone to come for three. It's been quite hot and they were obviously feeling it. Anyway, we managed to get an awful nice man called Robert Bell, who has been shearing fro 50 years (sure keeps you young!). We brought the girls into the garage yesterday lunchtime so that they would be dry. The weather's been a bit unpredictable here for the last week with some heavy showers. Well, she's still sitting tight. The broody is a young Black Rock - I'm surpised at that, I would have thought one of the pure breeds was more likely, and not very likely at that. In fact, I had asked Andrew for one of his Silkies as a broody, before they both turned out to be boys. I bought 6 RIR and 6 Cuckoo Maran eggs for her - I've put 8 in the incubator and 4 under her (I could only get eight in the incubator as they were good sized eggs). I was reluctant to give her all the eggs, because I don't know how reliable she will be. Another breakout! And a lock-in. I didn't have a good mroning today. Since it's the first day of the school holdays and Dan's at home childminding, I told him to lie-in and I'd do the morning round. Usually, I'm very organised but somehow, this morning, I failed to shut in Chip and the girls properly and forgot to let the ladders down on the big ark, so four hens didn't get out until midday. Fortunately, no-one seems any worse for my slip-ups, although Dan was pretty frazzled trying to get seven, 6 week-old chicks back in the run, with the "help" of our two dogs! Read more on Another breakout! And a lock-in.